Handbook on pressurized irrigation techniques (in a ring binder) PHOCAIDES A. Increasing the efficiency of water use and enhancing agricultural water productivity at all levels of the production chains are becoming priorities in a growing number of countries. In particular, shifting to modern on-farm irrigation practices can contribute to a substantial increase in both water use efficiency and water productivity. 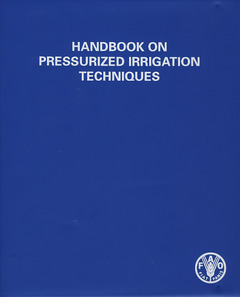 The objective of this handbook is to provide a practical guide on the use of pressurized irrigation techniques to farmers, irrigation technicians, and extension workers in the field. In this second edition, the handbook has been considerably revises, including new chapters on low-cost drip irrigation and pipe distribution systems for smallholders.